Today, Americans can carve a turkey and light a Menorah at once. That’s because Thanksgiving and the start of Hanukkah fall on the same day for the first time in anyone’s memory. It might be the last time. According to calendar watchers who have crunched the numbers, the next Thanksgivukkah lies almost 80,000 years distant. But resist chucking your Menurkey and shredding those sweet-potato latke recipes. My guess is that the yawning chasm of time will close up sooner than anyone thinks. Why? Our calendars are imperfect. They are pegged to human events, not solar or lunar ones. Hanukkah was inspired by the rededication of a holy site in Jerusalem that was damaged and defiled in a war about two centuries before Christ. (The word Hanukkah derives from a Hebrew translation of the verb “to dedicate.”) Hanukkah also stretches over eight days in the Hebrew month of Kislev, which has no direct relationship to any month in the Gregorian calendar most of us follow. Thanksgiving started out in America as merely a remembrance of the pilgrims’ progress in the New World, with states and communities left to honor that effort when and how they wished. No official recognition came until 1789, and even that was a one-day-only proclamation emphasizing a citizen celebration of America’s 9-month-old Constitution. No more proclamations came until President Lincoln issued one in 1863 as balm for a war-weary nation and set the Thanksgiving date as the last Thursday in November. Other presidents made the act of proclamation itself a tradition until 1939, when Thanksgiving was scheduled to land on Nov. 30. President Franklin Roosevelt was asked by retailers wanting an extra week of Christmas sales to move Thanksgiving. He did, to Nov. 23. He moved up Thanksgiving the following year, too. Those changes wound up causing more consternation than contentment. Americans were divided between recognizing the traditional Thanksgiving and the new “Franksgiving” as it was derisively called until Congress passed a law 1941 that Thanksgiving should fall on the fourth Thursday in November. The calendars themselves keep changing, too. The Gregorian calendar requires periodic adjustment — a leap day added every four years — to correspond not only with the sun’s behavior in our sky, but also because Christian tradition insists that Easter remain close to the vernal equinox. The Gregorian calendar spawned from the Julian calendar, also containing leap days. The Julian one grew out of a Roman calendar that incorporated a whole leap month. Likewise, the Hebrew calendar factors in some leap time to prevent holidays from drifting too far into one month from another. 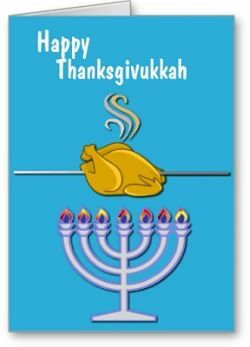 So, the notion that either Hanukkah or Thanksgiving is locked down or immovable for another 79,811 years strikes me as 798 centuries premature. Time, politics and perception are certain to whittle at our attitudes toward both. Already, Thanksgiving is thought to be under assault by retailers trying to move the official start of Christmas shopping into the holiday itself. A day set aside for counting our blessings may devolve into a day for counting cash instead. Especially if Menurkeys become popular.